Big Dogs: Large Stories – Paintings by Jennifer Fisher Jones. Stories by Human Companions. Paintings by Jennifer Fisher Jones. Stories by Human Companions. Big Dogs : Large Stories was born from a tenacious love for my own dog and and recognizing this deep connection in others through the the creation of my “Atypical Pet Portrait” commissions. I found the collaboration between myself, the animals and their humans to be quite profound. I have found when people talk about their dogs, the origin of communication shifts from the head to the heart, which is glorious indeed. The anecdotes , idiosyncrasies, heroism, and heartbreaks shared were vast and varied and informed the portraits from start to finish. 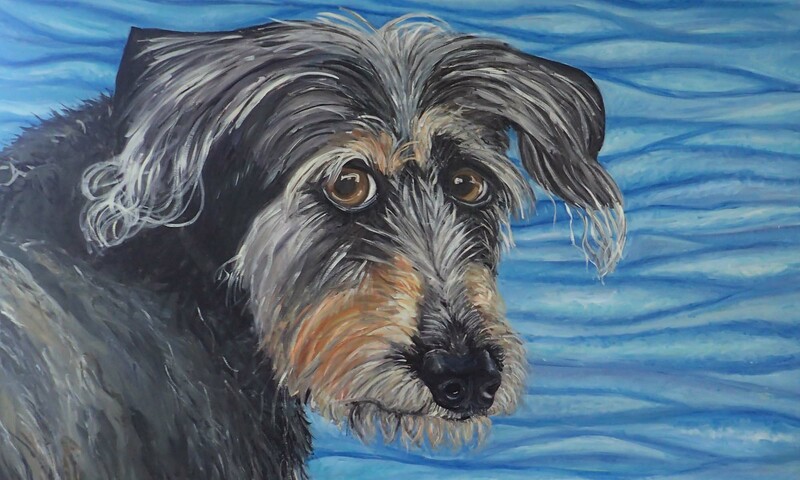 All this outpouring of affection and connectivity gave me the irrepressible urge to collect a selection of dogs’ stories and paint their portraits super sized to represent the deep and thorough love that they elicited in their owners. The owners were asked to put their dog’s story into one page of writing with the understanding that it would be part of a traveling exhibition, making this collection of “Big Dogs : Large Stories” truly a collaboration between dog, human and artist. Since the collection is ever evolving a blog format seemed to be a perfect vehicle to share these incredible dogs and their humans.